Rituparna says that women often tend to find it tough to prioritise between personal and profession lives, which results in most of them dropping out of the workforce. Women in Tech is a special series of stories of women who have pushed boundaries to make it big in the Indian tech space, which is still largely a male domain. In this series, we ask them what it’s like to be a woman in Indian tech, the challenges they face and lessons they can share from their journey with aspiring women technologists. You can never find the perfect work-life balance. It’s always about priorities, says entrepreneur Rituparna Mandal. 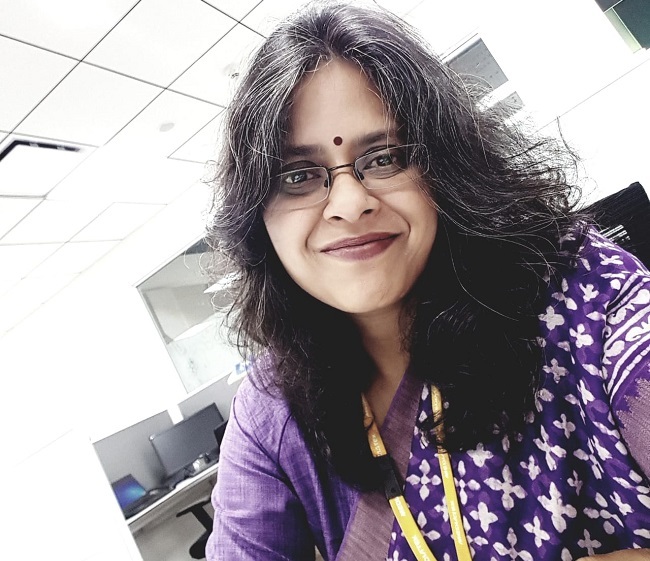 From working at senior levels at Texas Instruments to having founded Immensa Semiconductors, which got acquired by MediaTek, Rituparna has over 20 years of experience in the semiconductors and electricals space. And this has meant that for most part of the last two decades, Rituparna has had a hectic professional life. On a person level too, she has gone through various phases including giving birth to two boys (now 14 and 9 years) and supporting her father through cancer treatment. And none of this has deterred her from moving forward in her career and becoming a notable name in the semiconductor industry. Rituparna says that the life of an entrepreneur isn’t any different from that of a person working in a high-pressure job. And in her opinion, work and life isn’t something that actually needs to be balanced. Everyone has priorities and they keep changing. When a woman gives birth, her priority would mainly be taking care of them. For some, it will be their work or projects they’re working on. Rituparna says that if you are clear in your head about what your priorities are in terms of where you want to focus, you will find support systems to handle the other things. “For example, when I founded my company, my father was diagnosed with cancer. So, in addition to my kids, I had to spend some time supporting and helping him. Thankfully, he is fine now, but there was extra effort that I needed to put in. In such cases, you develop other leaders under you. I worked on creating that bandwidth of leadership under me who I trust and offload on, when I have requirements in my personal life,” she adds. Same is the case with work. One needs to create a support system at work. “That’s the way I see it. Balance is never there, you can never find the perfect balance. You may always feel that you are not giving enough to one side, not just your family. Sometimes you feel guilty that if you dedicated more to work, you would have achieved so much more. I think it’s a question of creating peace within yourself that we are human and there is only so much we can do and accept that,” Rituparna says. However, women tend to find it tough to make that choice, which results in most women dropping out of the workforce. While there has been an increase in the number of women entering the technology field, Rituparna says that at a senior level, there is still a high number of dropouts. “They are not able to find that balance, or prioritise and they invariably become the care givers of something that is much more important in their mind,” she adds. Hence, while there is an increase in women in technology today, doing great work, it’s not as much as we should be seeing, Rituparna opines. Women dropping out of senior roles is a concern that needs to be addressed and while she feels that more companies are taking cognisance of this, it may not be enough. Having more mentors, be it women or men, assigned to women going through a tough phase can really help them overcome it, Rituparna says. “It’s a question of giving support during a difficult time to make sure a woman has the required support system whether at work or at home. It is important to help them get over that bump and making them see what the reward is at the end of the day. If a woman is leaving her baby at home and coming to work it because they find the work exciting, it gives them stimulus just like your own baby does. There has to be something that drives you and makes you come to work and make sure you balance things out and make it work,” she adds. Companies too, in her opinion, should have a more sensitive atmosphere where they can assure female employees of all the support required and give them the confidence to come back to work. They should be more welcoming, in turn helping women stay. “It is a fact that be it the semiconductor space, or any other space in fact, it is a man’s world. And there are definitely challenges when you are a woman in a male industry,” Rituparna says. Rituparna recollects the time when she would go to startup, technology events where the number of women sitting in the room would be miniscule. While she didn’t let that come in the way of her career, building a company at the end of the day is not only about how technically good you are, but about business savviness and how much network you have. “Most business happens through building relationships and where these are being built. Mostly, they are in what you call the old boys’ network and that plays a big part in getting business and creating relationships,” she says, adding that a woman venturing out into this space definitely has to be bold and overcome such challenges. One needs to be able to go ahead and talk to whoever you have to, which may not always be easy. Looking back at the time when Rituparna had to travel to other countries on her own to meet customers, build relationships, she says that there were times when she was nervous travelling alone in a foreign city. However today, she says that there are platforms such as India Electronics and Semiconductor Association – that she is a part of – which help women a great deal in fostering relationships and building networks. “It takes some courage, especially when meeting customers. It’s not as easy. And these are challenges that a man probably doesn’t even think of at times,” she adds. But Rituparna didn’t let any of that hinder her entrepreneurial journey. Using her global experience from Texas Instruments, she went on to build a one-of-its kind semiconductor company in India that specialises in digital IP design. Immensa Semiconductors has an expertise in Logic Libraries, which Rituparna says is found in most devices we use at home today. Immensa eventually got acquired by global fabless semiconductor company MediaTek where Rituparna today holds the designation of director of advanced CPU and foundation IP technology and is general manager and director, Bengaluru for MediaTek. But her biggest achievement so far is leaving a legacy of leaders, according to her. “Everywhere I have gone or worked, every single person I took under my wing to mentor is thriving in their professional life. And being able to leave a legacy of leaders and creating more leaders is something I’m very proud of,” she adds.